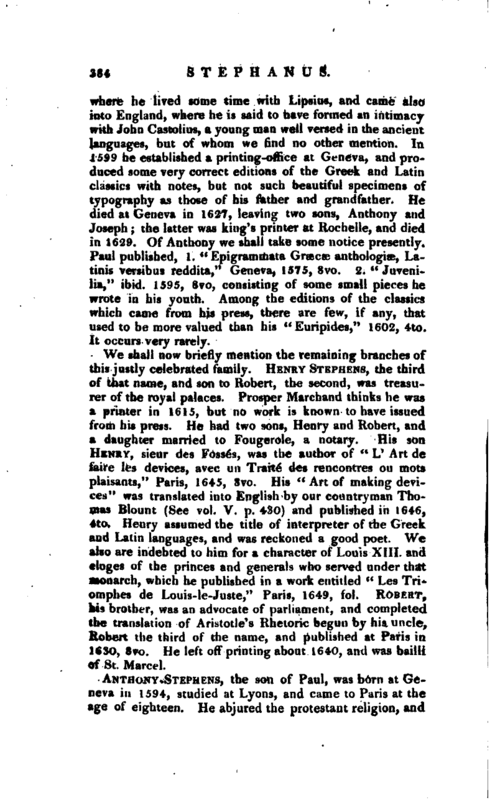 , the son of Paul, was born at Geneva in 1594, studied at Lyons, and came to Paris at the age of eighteen. He abjured the protestant religion, and | in 1614 obtained the title of printer to the king and to the clergy. The cardinal Duperron became his patron, and gave him a pension of 500 livres, which he enjoyed as long as that prelate lived. He reprinted for the booksellers of Paris, the Greek fathers, and published other important works, as Merin’s Bible, Duval’s Aristotle, Strabo, Xenophon, Plutarch, &c. He had by his wife Jean Leclerc several children, and a son Henry, who would have succeeded him, but he died in 1661. Anthony himself became unfortunate, and when infirm and blind, was obliged to solicit a place in the Hotel-Dieu, where he died in 1674, in the eightieth year of his age. 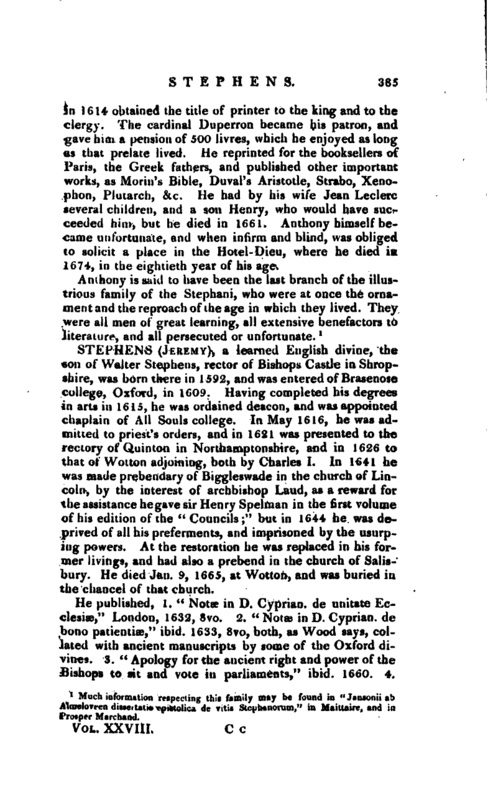 Much information respecting this family may be fount) in “Jansonii &\> Alrnelovreii dis.se, tatio cpistolica de vitis Stephanoruni,” in Maittaire, and in Prosper Marchaml.